Choose from thousands of spaces near the Emirates Stadium - including on-street parking, off-street car parks and 137 reservable spaces. The Emirates stadium is located in North London in the borough of Islington. Emirates stadium and Arsenal football club specifically strongly dissuade any visiting driver from arriving at the stadium by car with the public transport options that are available and due to the stadiums location within a heavily restricted residential area. On-street parking around the Emirates stadium on any day can be quite challenging because it is located within a densely populated residential area. Most of the nearby spaces on-street nearby are reserved for resident permit holders but there are some disabled and pay-and-display bays. However, on event days at the stadium special event day parking restrictions are enforced to ensure that residents are not affected or inconvenienced. As a result, some on-street parking bays will become suspended and some disabled bays will become reserved for designated Blue Badge holders as well as the majority of other spaces then either remaining or becoming resident permit holder only bays. These restrictions typically apply from 8.30am-6.30pm but in general, parking on-street on event days is not recommended. You can use the JustPark parking map to find information on available on-street parking spaces near the Emirates Stadium. Due to the stadium’s location in a residential area, driving to and parking close to the stadium is not recommended. With the public transport on offer for this venue, it is definitely worth considering parking up elsewhere – such as near Kings Cross – and arriving via one of the many tube and train stations in the area. 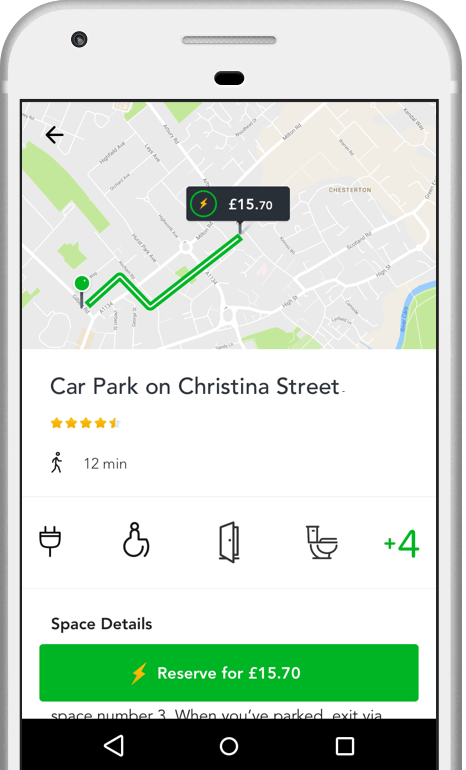 JustPark offers a wide range of reservable off-street parking nearby – in both council and commercially-run car parks, as well as at hotels, offices and on private driveways. You can browse these options and book a guaranteed space via our website or app. The Emirates stadium is surrounded by a number of different stations all located quite nearby. Both Arsenal and Holloway Road tube stations form part of the Piccadilly London Underground Line and are a very short walk away to the Northeast and Southwest of the stadium respectively. Drayton Park station is also located equally nearby but only offers National Rail services. Around a 10 minute walk south of the stadium, Highbury and Islington station provides Great Northern Rail, London Overground and London Underground services on the Victoria Line. Please note that on match days, Drayton Park station will be closed and Holloway Road station is exit-only. Although it is advised to utilise public transport on event days when travelling to the Emirates stadium, there are some options for disabled drivers. Disabled drivers displaying their Blue Badge can park in residents parking bays during the hours of operation of the event day restrictions – that is unless the space has been reserved for a specific designated Blue Badge holder. There are a number of Disabled bays available nearby, but these can be limited – so it is worth reaching out to the Disabled Liaison Officer at your own club or at Arsenal to make arrangements to ensure you can easily access the stadium. There are a number of parking restrictions in place around the Emirates stadium which make parking nearby quite difficult at all times. However, on event days such as on most weekends when Arsenal football club play their home games, a special, wide-reaching event day Controlled Parking Zone comes into effect. Parking on-street during hours of operation becomes almost solely reserved for resident permit holders only. Islington Council have produced a boundary map on their website showing which streets will be affected on event days. On the JustPark map, we’ll only show you spaces which you’re allowed to park in during the time period you require. The special event day Controlled Parking Zone restrictions apply from 12noon-4.30pm on Sundays and on Bank holidays. Drivers are best off finding overnight parking nearer to Kings Cross or Islington, both a short drive away. The Emirates stadium is the home of Arsenal Football Club. The surrounding streets come to life on match days as gardens and driveways become day time street shops selling merchandise and food as the Arsenal carnival comes to town. On any day though, the green spaces that litter the area are enjoyed by many – such as Highbury Fields, a large open field with a real community feel, complete with tennis courts and pathways making it a really welcoming spot for relaxing. Rated 5 stars with an average satisfaction rating of 96%, JustPark is the UK’s favourite parking service. But don’t just take our word for it – check out some of the latest customer reviews for our Emirates Stadium parking spaces at the bottom of this page.